I’d love to double this recipe to take as a potluck dish. What would you recommend for cooking times? As long as you have a big enough slow cooker, the time should be the same! I cooked your salsa chicken recipe for my family and we ALL loved it! It can be quite challenging to find healthy, tasty meals that everyone, even the teenagers in the house, loves. The fact that it was an easy slow cooker meal was just an added bonus for me. Thanks! The salsa Chicken looks yummy and love being a Slow Cooker version! Version? No. This is a more than common thing here in America. This looks delicious! Also, slow cooker recipes are my favorite! Slow cooker-cooking is always wonderful! Yay! Love finding new recipes for my slow-cooker! Barely a recipe, but a delicious combo! I finally got to make this salsa chicken this past weekend and it was such a hit!! I found your post from Pinterest! I’m also gonna pin this post on my Pinterest board my followers will love it. Thanks for sharing, Rebecca! SO glad to hear it! We just had ti this week! Just a jar of salsa and chicken though! Always changing it up with a new salsa! This looks hearty and tasty! Yum! Looks delicious. I agree, the old school slow cooker/crockpots work so much better than the new ones. Right? Haha! Vintage is best! Such a great slow cooker recipe, I love the flavors! This looks delish! I make one simular but you add in extra spices for even more yum! I also call it both just depends on the mood I guess! Can’t wait to try this! It’s always been one of our favorite meals! Just so easy! DELICIOUS!!! Thank you for sharing! Sorry I am new to slow cookers- do I want to cut the chicken in half to make each piece thinner or cut in half to make them shorter? You actually don’t have to cut anything at all! I wrote this recipe awhile ago, but I don’t cut the breasts anymore. I love how easy this is! I’ll be featuring this recipe next week at Saturday Dishes! Thanks for sharing! Thanks Lisa! It is such an easy go-to! I love easy Crock Pot recipes! Yes, I call it a Crock Pot. But I often wonder if I should go back and change it to slow cooker in all of my posts since Crock Pot is technically a brand of slow cooker. Oh well. Thanks for sharing the recipe. I found it on Saturday Dishes. Awesome recipe to try at home. Looking good. Will try this in my slow cooker. Thanks 🙂 Let me know how it comes out! This is one of my families favorites! This looks delicious! I love chicken, I love salsa, what a great combination! Thanks for sharing at Show Off Fridays and I hope to see you again this Friday! Well, I actually have two and consider one a crockpot and one a slow cooker. The first is old and the second is new (and not working…GRRR!). Love the recipe! This looks fantastic! Going to the store asap! Thank you so much for sharing! I call it a crockpot and mine is new, but I’ve yet to break it out of it’s box. You just gave me a great reason 🙂 Thanks! Wow! What a great way to add a lot of spice to an otherwise ordinary chicken. Your Salsa Chicken should be a hit with friends and family! And since your crockpot is old you might want to check out this crockpot giveaway. Who knows, you might win! I love slow cooker/crockpot recipes!! I bounce back and forth from slow cooker to crockpot…I am definitely going to give this one a try 🙂 I have jars of my homemade salsa that would go great with this recipe. I think I might serve it over brown rice or quinoa. Thanks for sharing!! This recipe looks PHENOMENAL! I wanted to eat chicken so badly for lunch today but didn’t get the chance. Now I am regretting not seeking out some delicious chicken! YUM that looks great buddy! 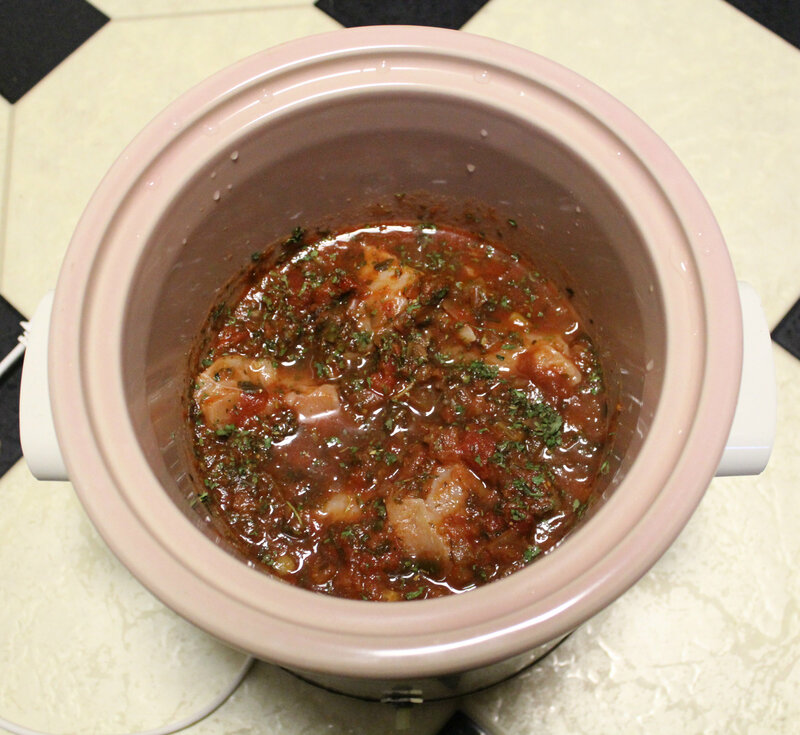 Here we call them slow cookers…when I first read about crockpots online I thought it was something different haha! Yum! looks amazing! I call it a crock-pot and actually thought they were different things for years! Haha! Haha, I guess it is just what you heard growing up that determines it! That looks SO good. I love slow cooker meals. When I saw this in the picture of the linkup, I was like yep I definitely have to check this out. I’m glad I did because this looks amazing. Thank god I just bought a ton of chicken because I’m making this immediately. Awesome! I am glad it caught you eye 😉 You will not be disappointed! Buy a new one! I am sure you can find cheap ones on amazon or ebay! I never used to use the slow cooker, but I have been trying it out more and more. I bet you could also just throw the all the ingredients in a large baking dish and cook at 350 for 45 minutes! Looks incredible! I eat chicken daily, so can’t wait to try this out for a little change up in flavor!! Its so easy and quick to just throw together! I always used to say crockpot, but I feel like more people say slow cooker now. I have what I need to make this and toss in some potatoes with it, boom dinner done! And isn’t “crockpot” an actual brand of slow cooker? This chicken goes so well with potatoes! But tonight, I am having mine with roasted couliflower and acorn squash! I just put it in the slow cooker for dinner tonight!